To Decant: (verb) To pour from one vessel into another. It’s been a while since I last posted (so sorry!) and just wanted to give you all a quick weekend wine tip to kick start your Saturday! Over the years I’ve learned to love and appreciate the process of drinking wine. So for those of you that always wondered why anyone would pour wine out of a perfectly good wine bottle into another container…here’s why. The beauty of wine, is that is changes flavors and complexity as you enjoy it – so the wine you started with, may not taste the same on your palette by the time you have finished the bottle. This is because wine aerates as we expose it to oxygen. Often you’ll hear people say “this wine just needs to breath a little and it will be fantastic.” And in fact, that is exactly what it is doing when you decant it. It is “breathing” the air around it. But why do I want my wine to breath? In short, all of the flavors you want to taste in a great bottle are exposed and highlighted, and the less desirable, more gnarly flavors, dissipate. So why the fancy glass decanters? 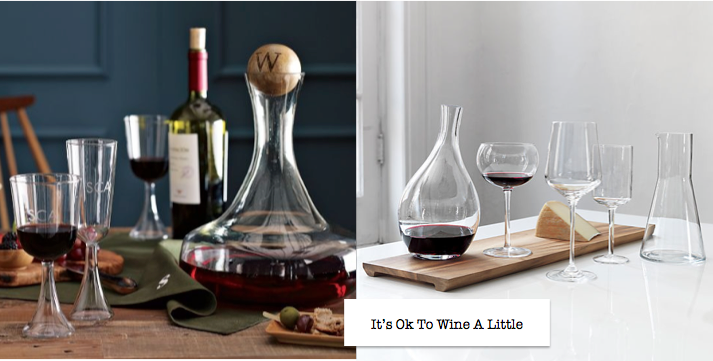 Wine will naturally aerate in your glass once it’s poured, however to speed up the process of allowing an entire bottle to “breath”, we use a decanter. It’s basic physics – the more surface area you expose at once, the faster the wine will begin to breath. Thus the shape of most common decanters. (The large bottoms all makes sense now huh!). You don’t need a traditional “decanter” to aerate your wine. If you don’t want to spend the bucks to pick one up, simply pour some of your newly opened wine into any glass you have available upon opening and leave the bottle uncorked. Buy removing a portion of the wine from the neck of the bottle, you have increased the surface area of the wine being exposed (the bottle neck is much thinner than the rest of the bottle…) as well as provided more breathing room for the wine itself to start the process. So use what you have at home, save some dinero, and enjoy your next great bottle. Cheers!